In the business world, the key to doing good business is to advertise well and in advertising, you have to be creative so that the attention of viewers are instantly caught and the name of the brand gets registered in their minds. There are a number of ways to do it, publicizing heavily through various media forms. But this requires some heavy investment which cannot be afforded by small businesses. If you want some creative but low-cost advertising, inflatable advertising products offer the best solution. Inflatable advertising products come in a multitude of varieties and are just as effective & colorful as flags and banners for people to notice your brand. The sizes of the items are mostly customized and adjusted according to requirements. The various products include air tubes, arches, costumes, giant inflatables, portable walls or boards, tunnels, replicas, totems, hot air balloons, show shells, helium blimps, holiday inflatables, golf ranges, balls or spheres etc. Custom Inflatable costumes are great ways of grabbing the attention of people. These are huge but act as interactive mascots for your brand or business. This unique way of promoting your products instantly attracts the crowd and your brand stays in their minds for a long time. 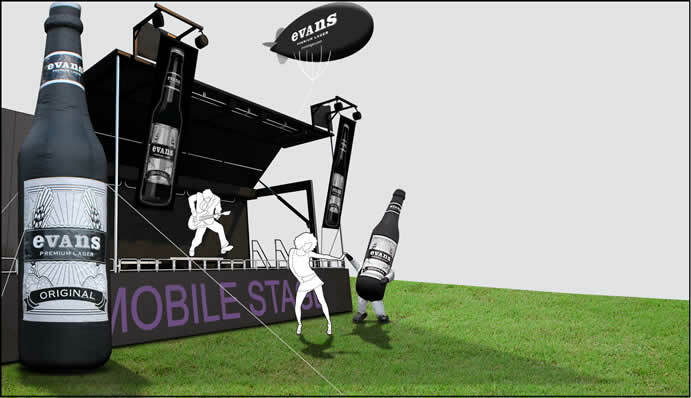 You can get the Inflatable advertising products manufactured for some kind of trade show or exhibition. These kinds of personalized inflatable advertising products will put your product as well as brand name into the highlight. These replicas thus come real handy. You can also try air tubes which keep on dancing and moving, thus attracting the attention of the crowd on a constant basis. They are very safe to operate as well. You can also go the traditional way and go for conventional inflatable items like movable walls which can be placed wherever you want. Simply place them wherever you feel people will be able to have a look and your job is done. Varied shapes of outdoor hot air balloons also come handy when promoting your brand. Since they float in space, they take up no place and hardly offer any hurdles in your movement. They also help catch the attention of people who are far off, very easily. The same thing can be said about helium blimps as well. In fact, they act as guiding objects for people to find your stalls, especially when you participate in some kind of fair, exhibition or show. You can go an extra mile and opt for exhibiting in inflatable shells instead of normal tents. This can lend you an extra edge over your other competitors. Arches and tunnels are interactive, eye-catching and dramatic tools to make sure your display stands out from the rest and draws in the crowd. Inflatable products are cost effective as well as attractive gears to boost up any business or brand. Their main attraction lies in their simplicity, they are so simple yet so effective.